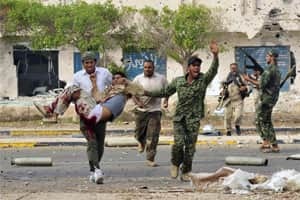 Sirte, Libya: Libyan interim government fighters captured Muammar Gaddafi’s home town on Thursday, extinguishing the last significant holdout of resistance by troops loyal to the deposed leader and ending a two-month siege. The capture of Sirte means Libya’s ruling National Transitional Council (NTC) should now begin the task forging a new democratic system which it had said it would start after the city, built as a showpiece for Gaddafi’s rule, had fallen. “Sirte has been liberated. There are no Gaddafi forces any more," said Colonel Yunus Al Abdali, head of operations in the eastern half of the city. “We are now chasing his fighters who are trying to run away." Another commander confirmed the city had been captured and some rebel fighters beeped their car horns and shouted “congratulations" to one another. But many were still edgy and troops did not allow reporters to enter the positions formerly held by the Gaddafi loyalists as they said mopping up operations were still underway. A group of some 40 vehicles carrying Gaddafi forces had broken out of the city and had headed west, NTC fighters said. “The Gaddafi people broke out west, but the revolutionaries have them surrounded and are dealing with them," said one of the fighters, Abdul Salam Mohammad. Reuters saw NTC vehicles enter Neighbourhood Two, the last part of Sirte held by Gaddafi’s men and also other vehicles racing towards the west. Two dejected-looking Gaddafi prisoners were marched down a street, guarded by a pair of NTC fighters. The sound of shooting could be heard coming from the west of the city. Hundreds of NTC troops have surrounded the Mediterranean coastal town for weeks in a chaotic struggle that has killed and wounded scores of the besieging forces and an unknown number of defenders. NTC fighters said there were a large number of corpses inside the last redoubts of the Gaddafi troops, but it was not immediately possible to verify the claim. Thousands of civilians have fled Sirte which had a peacetime population of 75,000 and now lies largely in ruins from the rocket, artillery and tank fire which rained down on the town for weeks.